Many contemporary social movements observe, copy, learn from, coordinate and cooperate with other movements abroad, and some mobilise to influence processes of global governance. Can these transnational dimensions of mobilization transform the territorial scale of political debate on issues of common concern in public spheres? In contrast to many existing studies, which focus on the media as carriers of public sphere transnationalisation, this book presents a theoretical and empirical exploration of the role of social movements in such processes. As ‘arenas’ or subaltern counterpublics in themselves, social movements may provide a setting in which activists come to frame claims in a comparative manner, interact with activists from other countries, frame problems as matters of transnational concerns or consider themselves members of transnational communities. As ‘actors’ social movements may contribute to the transnational transformation of public spheres by directing claims to political authorities beyond the state, claiming to represent transnational constituencies, and focus on similar issues and use similar frames of reference as movements abroad. 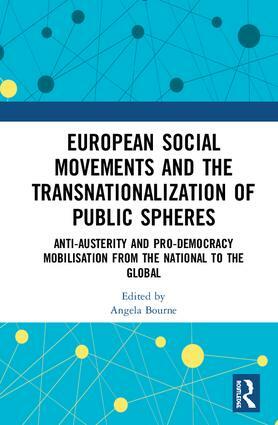 The book’s case studies addressing efforts to build transnational social movements and transnational dimensions of anti-austerity and prodemocracy movements in Spain, Portugal, Greece, Turkey and Ireland provide contemporary empirical illustrations of such processes at work. The chapters were originally published in a special issue of the Journal of Civil Society. Angela Bourne is associate professor at Roskilde University, Denmark. She researches on EU and comparative politics, transnational mobilisation of social movements, responses to extremism and the proscription of political parties. She has published in European Journal of Political Research, Democratization, European Constitutional Law Review and Journal of Common Market Studies.